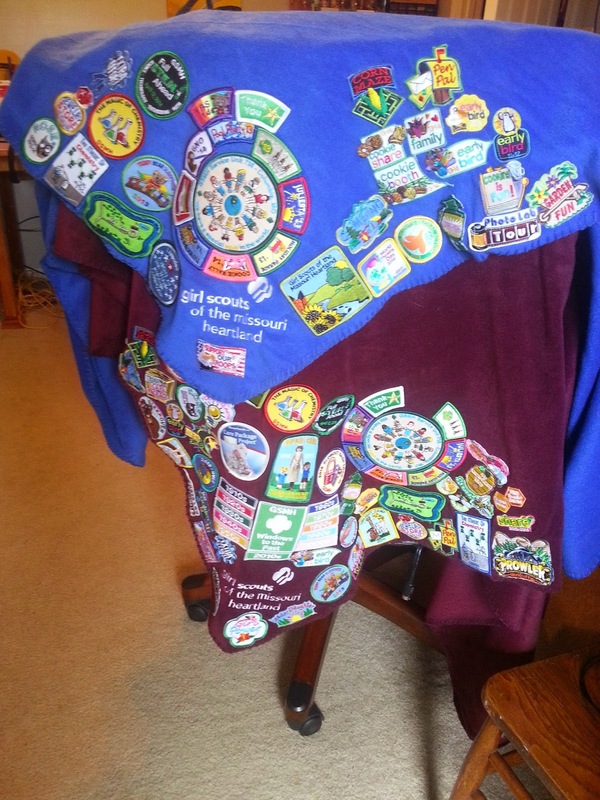 Girl Scout Leader 101: Badge Blanket aka Fun Patch Overload! Sometimes the best and easiest types of posts comes from questions I get from blog stalkers (affectionate name I have for my groupies... ha!). "I had a question, when your girls runs out of room on their vest, it's common for you to use a blanket? Just wondering so I can plan on having a quilt made for my Junior. Her vest is full on the back and she completing her last year as a Junior this year. Do you have any specific references or referrals of websites for this? I have an amazing seamstress that would do it for me, just need to get the materials for her and show her a picture. I wanted to go to the expert first as there is different stuff online." You know.. that's something I hadn't really even thought about. I mean... of course the girl and I both have blankets, but I didn't think about making it a post! What an awesome idea!! My troop does a LOT of stuff. Not as much as others, more than some, but we have fun and that's what matters. The "problem" (though I don't consider it one) is that means we get a LOT of fun patches. They aren't earned badges for all these fun events we go to, but they are mementos of memories made and fun had. They need to be kept, but come on! The back on the vest isn't big enough a lot of times... and if you are using sashes for your troop... HA! Good luck with finding room for all those patches! The solution I came up with isn't a new one. It's a tradition passed down and I latched on to it like there is no tomorrow! A badge blanket! It's a blanket for all those patches that no longer fit on the vest. A place for all that fun to be together in one place. The really fun part is, you can start it at anytime and continue on for however long it take to fill and then start another one if you want. It's all good! There is not right or wrong way. 1. Our Council name is on them. 4. Big enough to cover more than just one year. I've seen others with vest pillows where they turn their daughter's vest into a pillow for her room when she bridges to the next. I've seen capes. I've seen leaders buy sashes and sew them onto the bottom of the vest like a ruffle or extension. I've seen a lot of different ideas, but I am sold on the blanket. The blanket is awesome. I take it with me to overnights and I can sit and tell the girls about the different patches and events... what we did... what I remember... and if it happens again and "do they want to go?!" It's a great way to get girls excited about events. All those memories on one handy dandy blanket. The reason I don't like cutting vests to make into a quilt is because I have this nostalgic hope that one day... maybe my granddaughter will want to pull out her Mommy's vest and wear it in a parade or take it for show n tell to a troop meeting. Sniff sniff... makes me teary thinking about it, actually. So, yeah... find yourself a blanket! Want a quilt? Get a quilt! Make a quilt! No rules to it. Find something you want and then cover it up with patches. TIP: My stepdaughter now knows that when she gets a fun patch I'm going to ask "Vest worthy? Blanket patch?" It isn't that the blanket isn't as important, but it allows her to prioritize what is on her uniform that people see at each event we go to and which ones as on the blanket and only seen at overnight events. And yes... we have some patches that are vest and blanket worthy and we buy extra, so both have them. That's mostly SU events and I have an inside connection there to get more patches.